Forced Migration Review, June 2018. The Forced Migration Review (FMR) magazine Published a special feature on humans and animals in refugee camps with two aims. 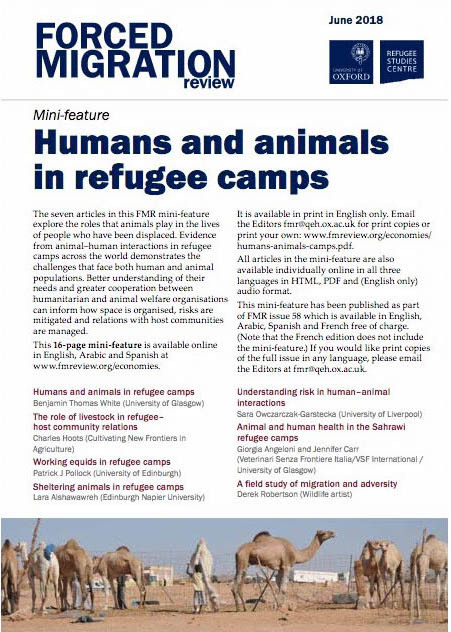 First, to highlight for practitioners and policymakers the variety and importance of human–animal interactions in camps, drawing on the experiences of an international team of contributors. Second, to spur further research on the topic, and suggest some of the directions it might take. 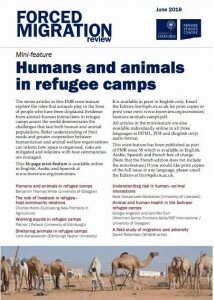 The seven articles publication explore the roles that animals play in the lives of people who have been displaced. Evidence from animal–human interactions in refugee camps across the world demonstrates the challenges that face both human and animal populations. Better understanding of their needs and greater cooperation between humanitarian and animal welfare organisations can inform how space is organised, risks are mitigated and relations with host communities are managed. The special feature includes an article by Giorgia Angeloni based on VSF-Italy expericence in the Saharawi refugee camps, and an article by Charles Hoots on VSF Canada/Germany interventions in South Sudan.